This project is a result from PAT 552 - Interactive Media Design II taught by Dr. Michael Gurevich. Developing a new musical interface and finding the right sound for it are frequently divided into two separate challenges in computer music. The disjunction between interface and sound in modern digital musical instruments can liberate a musician to map any sound of choice to the instrument. But with this freedom comes a much greater set of responsibilities. After designing the interface, to create a compelling performance the artist needs to create or choose their sound palette, map the right sounds to appropriate gestures, and forge a coherent connection among sound, music, gesture, and interaction design. In contrast, writing a piece for an acoustic instrument is more restricted in that the sound of the instrument is bound to its physical mechanism of sound generation (e.g. a bar striking a metal string), and therefore to a great extent, gesture and sound are inextricably linked; dictated by the instrument. This relationship drives different kinds of creativity given the constraint. It is an area where one worries less about issues like mapping, metaphor, embodied interaction, or tangible interfaces, and focuses more on sound itself, and ways to organize sound musically. 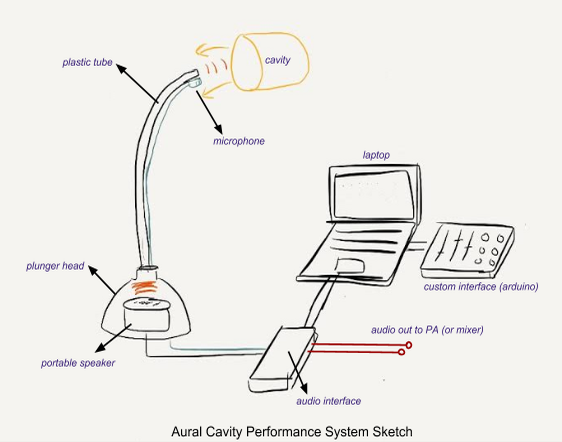 Aural Cavity is a composition piece that employs a hybrid digital-acoustic instrument in an attempts to embraces such constraints that are features of acoustic instruments. In the process of co-developing the musical instrument and composition, we focused on interacting digitally with acoustic phenomena, and discovering ways in which to fashion this suite of techniques into a musical instrument. We sought to explore how we can create a “NIME” along the lines of old-fashioned ways of making musical instruments or lutherie: discovery, assembly, carving, and sculpture; instead of synthesis, patching, mapping, and design. The sound generation mechanism compels an artist to find the right apparatus—either physical or digital—to shape the sounds in service of musicality; as the apparatus develops, the musician must then also discover and unlock its inherent musicality. In our case, we consider the computer as one of many tools to flexibly integrate into this process, as opposed to being simply a synthesizer or sensing interface as it typically is in digital musical instruments. Aural Cavity is the result of this process. It utilizes a custom instrument that generates sound based on audio feedback. The instrument is made of a plunger head, a portable speaker, plastic tube, clip microphone, a DSP patch running on a laptop, but most importantly, it requires an object with a cavity, such as a cup, bottle, or the performer’s mouth. A cavity is used to generate sound by closing the audio feedback loop between microphone and a sound channeled through the end of plastic tube. The apparatus therefore in some ways resembles a talkbox, but functions completely differently. A talkbox only loosely couples to resonant objects, which act as filters on the audio source. In our instrument, the shape, the size and the position of a cavity that a performer choose determine timbre, level, and resonating frequency of the feedback sound. A cavity of which a performer can manipulate the shape, such as oral cavity, give more immediate control over the sound. Furthermore, a DSP patch coded in ChucK running on a laptop expands the expressivity of the instrument with a custom-made interface (see the diagram below). The feedback loop is completed through the computer, which puts a DSP algorithm in the middle of the signal chain, giving the performer a set of creative digital controls over properties of the audio feedback loop (and signals to inject into it) that complement the physical manipulation of the tube and cavities. Alvin Lucier’s works that create tools to articulate acoustic phenomena served as a direct inspiration. Whereas Lucier’s music, like Vespers and I Am Sitting in a Room, promote exploration of acoustic phenomena, resonance and feedback, on an architectural scale, we sought to create a micro-scaled pieces that incorporate the use of micro-architectural spaces (cavities) and recursive playback of recording without interval (feedback). 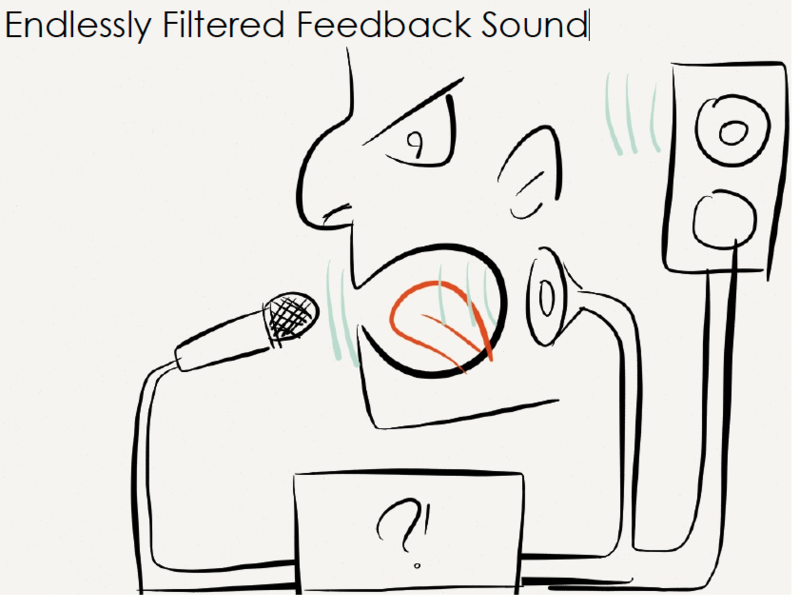 The idea of using feedback has many precedents in contemporary music; pieces like Steve Reich’s Pendulum Music, and especially David Tudor’s Microphone were other points of inspiration and departure. The central idea driving the piece is to establish a unique sonic identity of the performance system; to articulate the process of interaction and discovery through the musical artifacts that are created. The piece explores relationships between the digital and acoustic worlds through audio feedback, signal processing and the acoustic cavities used. The music steps through pitched feedback sounds with various cavities including everyday objects, and eventually the oral cavity, which creates a kind of climax in the piece. We are in the process of creating a new suite of custom 3D-fabricated cavities to complement the everyday objects. Changes in the signal processing algorithm and the cavities are sequenced arhythmically to create diverse timbres. The piece evolves from purer feedback tones and gradually builds up more distorted, richer timbres. Towards the end, a second instrument of the same kind is introduced, which provides a textural background with much longer delay (i.e. 10 seconds), creating feedback of output from the past to the input at the moment. This second instrument operates with minimal physical intervention; its sonic variation comes from digital algorithmic and parametric controls. We continue to improve the performance system and show several refinements in the NIME performance. Mar. 2014 Performed Aural Cavity @ Performing Arts Technology Showcase Concert 2014, Britton Recital hall (Video). Mar. 2014 Performed Aural Cavity @ Class Concert of Interactive Media Design (Video). The following projects are results from Interactive Media Design I/II class (PAT451/452) taught by Dr. Michael Gurevich. collaborative live coding and MANET paper are accepted in NIME 2014. Yay, we are going to London.